When you research ways to market yourself as a writer, you’ll run across experts who talk about creating a strong call to action. But what is a call to action? And what does it mean for creative writers who want to build their reputations and sell books? Let’s take a look. A call to action (or CTA) is anything that gives your target audience the opportunity to take an action: sign up for a mailing list, download a digital freebie, follow you on social media, or buy a book (making a sale is also sometimes referred to as “converting,” as in converting a browser to a buyer). Often a call to action is a clear directive or instruction: Click to buy. Sign up now. Read this today. 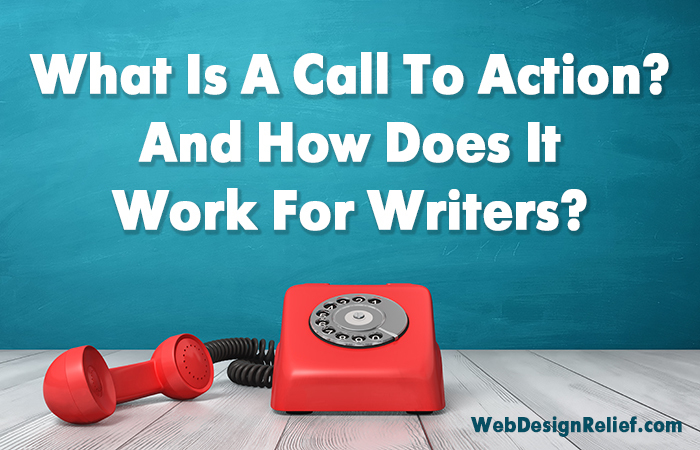 Anything you use for marketing should offer a call to action, from author websites, to rack cards, to business cards (click here to learn how to create a call to action on your writer business card). Whenever you offer your website visitor the opportunity to take an action, you’ve created a call to action. Even though you create a call to action, there’s no guarantee that your website visitor will actually do it. Since Web Design Relief creates websites specifically for writers, let’s look at how a call to action can boost the effectiveness of an author website. Concentrate on one—and only one—call to action. If you ask too many things of your author website visitors, you’ll overload them with choices—and they’ll leave without taking any action at all. Your website’s job is to make it easy for visitors to take the action you want, so focus on that one action. Use a pop-up. Visitors claim to hate pop-ups. And yet—pop-ups work. Here are some statistics and examples of pop-ups that create strong calls to action. Pop-ups force your visitors to give attention to the most important action that you want them to take, which makes them more likely to take it. Incentivize. Giving away a free goodie can help maximize the effectiveness of your call to action. For example, we give away free marketing tips to writers who sign up for our email list. Writers can give away free chapters, the opportunity to win prizes, and other digital freebies. Strike the right tone. Visitors won’t respond to your call to action if they feel bullied. Use a light touch when creating a call to action, and keep your website copywriting friendly and transparent. No hard sells! Question: As a writer, what’s the primary call to action of your author website? Leave us a link!